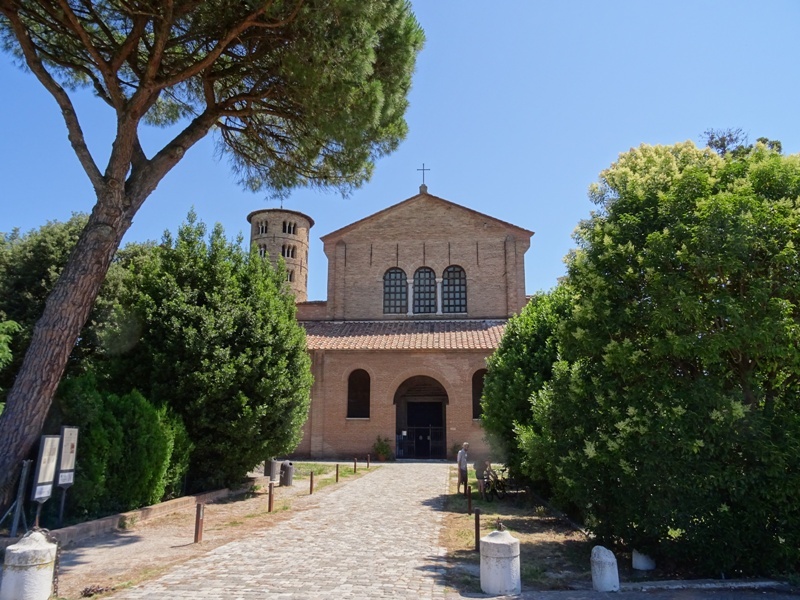 Of the eight UNESCO World Heritage sites in Ravenna, the Sant’Apollinare in Classe is the youngest monument. Classe is nowadays a frazione of the municipality of Ravenna, a small suburb located some five kilometres south of the city centre. By chance we visited the Sant’Apollinare in Classe first, even though it is the youngest monument. There was a very simple reason for this: we were staying at a lovely hotel next to the basilica, Hotel Classensis. From Classe, one can take the bus to Ravenna and back, which is a very easy and convenient way of travelling. It was during the episcopate of bishop Ursicinus (533-536) that construction of the Sant’Apollinare began at the site of a Roman-era cemetery in Classe. Ursicinus’ episcopate was quite short, and he did not live to see the completion of his church. His successors Victor (538-545) and Maximianus (546-557) continued the work, although the former’s role is not actually recorded. Bishop Maximianus consecrated the basilica in 549, just a little later than the more famous San Vitale in the centre of Ravenna. As with the latter church, construction of the Sant’Apollinare was made possible by generous subsidies from Julianus Argentarius, the mysterious banker who played a large role in religious life in Ravenna in the first half of the sixth century. 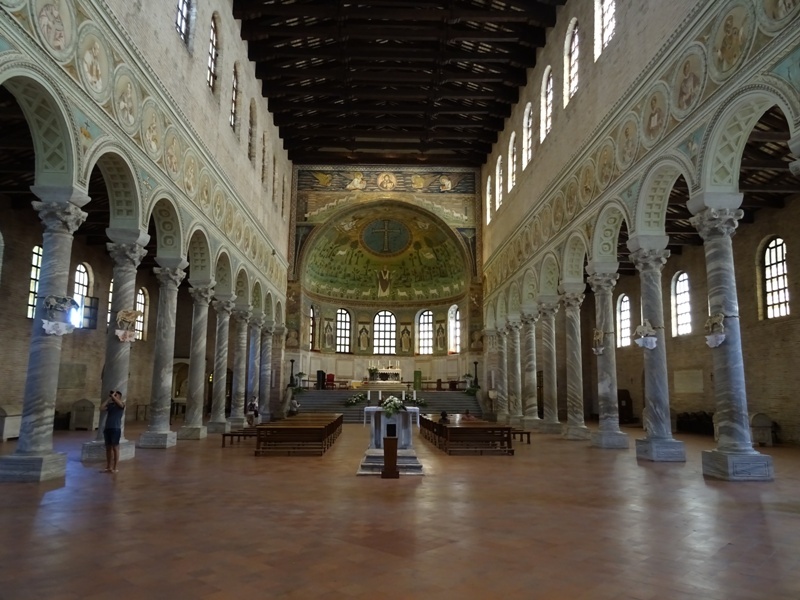 The Sant’Apollinare in Classe is dedicated to Ravenna’s traditional first bishop, Saint Apollinaris, about whom little is known and whose historicity can be doubted. The basilica seen from the side. The Sant’Apollinare is the only church in Classe from Late Antiquity that has survived. The basilica is in relatively good condition today, but it has suffered from neglect, pillaging, war and the forces of nature throughout the ages. 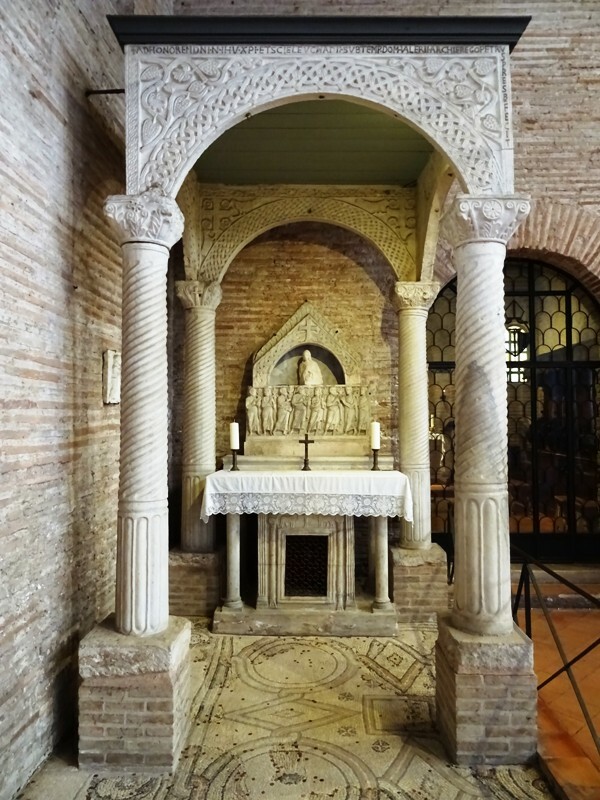 Sant’Apollinare’s relics were moved to the city of Ravenna itself in the ninth century, because they were no longer safe in Classe, which was frequently attacked by Muslim raiders. They were translated to the Basilica of Saint Martin, which was subsequently rededicated and renamed Sant’Apollinare Nuovo – the New Saint Apollinaris – to distinguish it from the old basilica in Classe. This sometimes causes confusion, as the “new” church is actually decades older than the “old” church. The Sant’Apollinare is the perfect example of a classical Roman basilica, with columns dividing the interior into a nave and two aisles. In this case the columns and capitals are made of beautifully carved Proconnesian marble. The walls of the nave were certainly decorated with mosaics once, but none of these have survived and nothing is known about the scenes that could previously be seen. Only the apse mosaics are still there and these will be discussed in detail below. 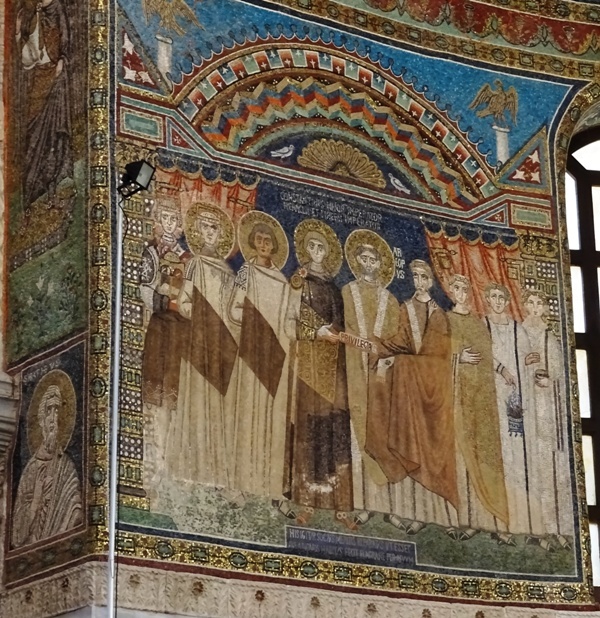 In a way, the Sant’Apollinare in Classe is the exact opposite of its namesake in Ravenna: there the original apse collapsed centuries ago and only the wall mosaics have survived, in Classe we find the reversed situation. In the church in Classe, there is still some decoration left on the nave walls: portraits of Ravenna’s bishops in medallions were painted here in the eighteenth century. Not all parts of the original basilica have survived. The narthex used to have two chambers, one on the north side and on the south side, but the southern one – possibly a late sixth century chapel – was completely destroyed in the nineteenth century. The north chamber now houses the ticket office and the basilica’s gift shop. Even though Classe faced attacks by Arab raiders, the Sant’Apollinare remained an important place of worship and a splendid cylindrical campanile was added to the building before the year 1000. The church’s floor was raised at some point in time, and regretfully the new floor is rather plain and unspectacular. Original floor of the basilica. Fortunately, parts of the original floor mosaics can still be seen in the north-east corner of the church and near the main entrance. Parts of the Latin text have survived, and one can make out words such as “GAVDENTIA”, “FELIX” and “SVIS”. 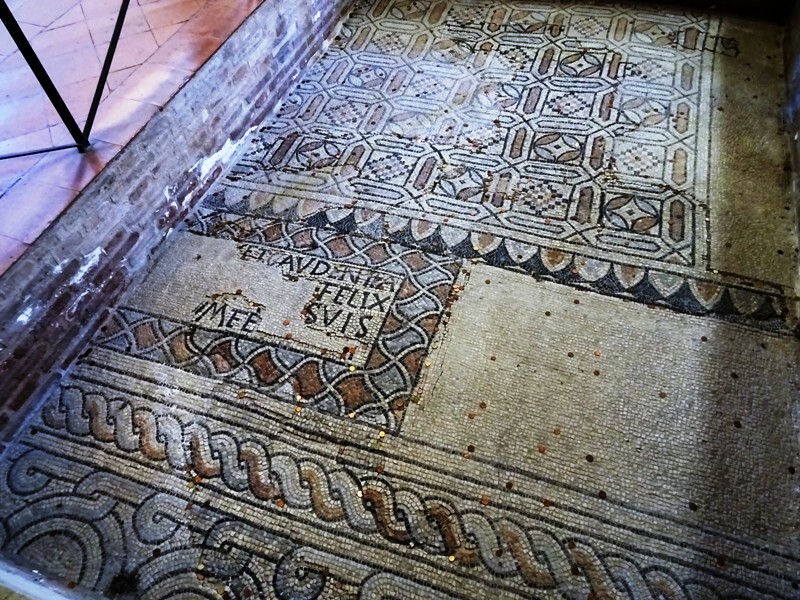 The last word is probably “FECERVNT” – “they made” – and likely refers to the persons who sponsored the floor, with both Gaudentia (“Joy”) and Felix (“Happy”) being given names. Apparently, there is a tradition to throw coins onto the original floor. What is interesting, is that people only leave low-value bronze-coloured coins, i.e. the 1, 2 and 5 Eurocent pieces. I do not know why or when this tradition started, but it is probably not very different from the practice of throwing coins into the Trevi Fountain in Rome. In the north-east corner of the church, one can find a late eighth or early ninth century ciborium or baldachin from the former church of Saint Eleucadius. Eleucadius was the third bishop of Ravenna, but again one can doubt whether he was a historical figure or just someone who was made up centuries later to fill the gap between the problematic Saint Apollinaris and the first bishop who can truly be considered historical, Severus, who was bishop in the 340s. In any case, the church in Classe dedicated to Eleucadius no longer exists; it was abandoned and demolished or destroyed ages ago and only the ciborium survived. The ciborium can be dated easily because of its inscription, which refers to the episcopate of Valerius, who was archbishop of Ravenna from 789 until 810. The inscription furthermore states that the ciborium was made by “Peter the priest”. Sant’Apollinare’s apse mosaics are deservedly famous. They were not all created at the same time, as will become clear below. CONCH Certainly the mosaic in the conch of the apse is original. It shows two scenes, one that features a large jewelled cross with the tiny face of Jesus Christ and another in which Saint Apollinaris is the protagonist. The cross, the two prophets floating in the sky – Moses and Elijah (labelled “MOYSES” and “HbELYAS”) -, the Hand of God above the cross and the three sheep to the left and right of the cross refer to the Transfiguration of Jesus Christ on Mount Tabor as described in the three Synoptic Gospels (Mark, Matthew and Luke). “28 And it came to pass about an eight days after these sayings, he took Peter and John and James, and went up into a mountain to pray. Face of Christ on the cross. The Transfiguration is a well-known theme in religious art and it has been covered by many famous artists, such as Raphael, whose Transfiguration – his final work – is now in the Vatican Museum (see Rome: San Pietro in Montorio). However, the depiction of the Transfiguration in the Sant’Apollinare in Classe is peculiar to say the least. 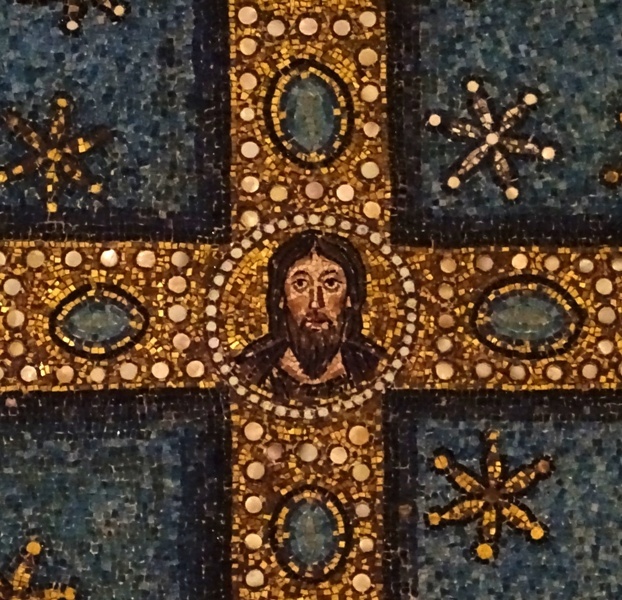 Instead of a Christ whose “countenance was altered”, with radiating white garments, we see a jewelled Latin cross with a miniature face of Christ. It is set against a blue background with 99 radiating stars, and to the left and right of the cross arm are the Greek letters alpha and omega from the Book of Revelation. Above the cross, we see the Greek word ΙΧΘΥΣ. ΙΧΘΥΣ means “fish”, but it is also a bacronym for “Ίησοῦς Χριστός, Θεοῦ Υἱός, Σωτήρ”, or “Jesus Christ, Son of God, the Saviour”, a familiar phrase for early Christians. Below the cross are, in Latin, the words “SALVS MVNDI”, “Salvation of the World”. The apostles Peter, John and James are represented by the three sheep. Moses is shown as a young man, while Elijah appears to be older, with his beard and long, flowing hair. Saint Apollinaris and two of his sheep. Note the red lines on the left. 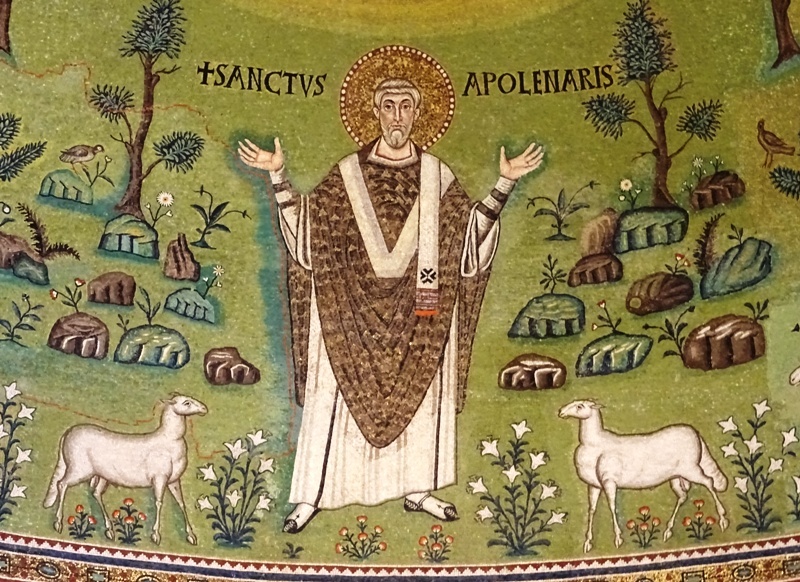 The central figure in the lower part of the mosaic is Saint Apollinaris, labelled “SANCTVS APOLENARIS”. He has a halo and is dressed in a chasuble with a bishop’s pallium. Apollinaris has his hands extended in the orans position and is standing in a beautiful green landscape with rocks, trees and birds. The level of detail is quite impressive. To the left and right of the bishop, twelve sheep walk towards him, representing either the twelve apostles or – because three of the apostles are already part of the Transfiguration scene – simply Apollinaris’ flock. 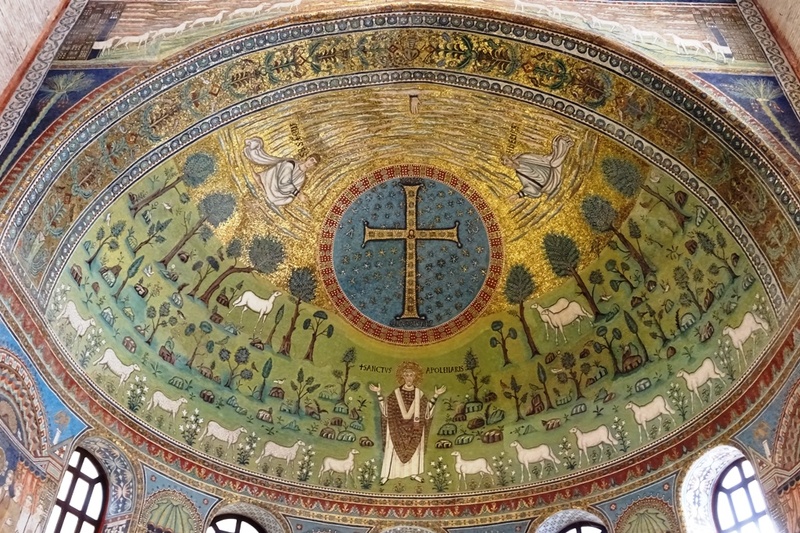 As with all mosaics in Ravenna, those in the Sant’Apollinare in Classe have been restored on many occasions. Red lines added in the 1970s indicate which parts of the mosaic are still original. – Busts of the Evangelists Matthew and Luke, made in the twelfth century. Mark and John are missing (although they do appear in the upper zone). It is not clear whether they were part of the original decorations. – The archangels Michael and Gabriel, believed to have been part of the original sixth century mosaics. They are dressed in imperial robes and are wearing red shoes. Each of them is holding a banner which reads “agios, agios, agios”, which is Greek for “holy, holy, holy”, no doubt a reference to the Holy Trinity and an anti-Arian statement. – Two date palms, which were almost completely restored during a renovation project in 1906-1907. – Two processions of six sheep, one from the direction of Jerusalem, the other from the direction of Bethlehem. – In the upper zone: a haloed and bearded Christ in a medallion, flanked by the familiar symbols of the four Evangelists, from left to right: an eagle for John, a man for Matthew, a lion for Mark and an ox for Luke. – Ecclesius (ECLESIVS), who was bishop of Ravenna from 522 to 532 and can be seen in the apse mosaic of the San Vitale, a church he founded. – Severus (SCS SEVERVS), who was bishop of Ravenna in the 340s and whose cult was gaining momentum at the time of Sant’Apollinare’s completion. A church dedicated to San Severo would be consecrated in Classe in 582. It was destroyed in 1820. – Ursus (SCS VRSVS), who was bishop of Ravenna ca. 405-431 (or somewhat earlier) and who was responsible for the construction of Ravenna’s cathedral (Basilica Ursiana) and the adjacent Orthodox Baptistery. – Ursicinus (VRSISINVS), who was bishop of Ravenna between 533 and 536 and who commissioned the Sant’Apollinare in Classe in the first place. 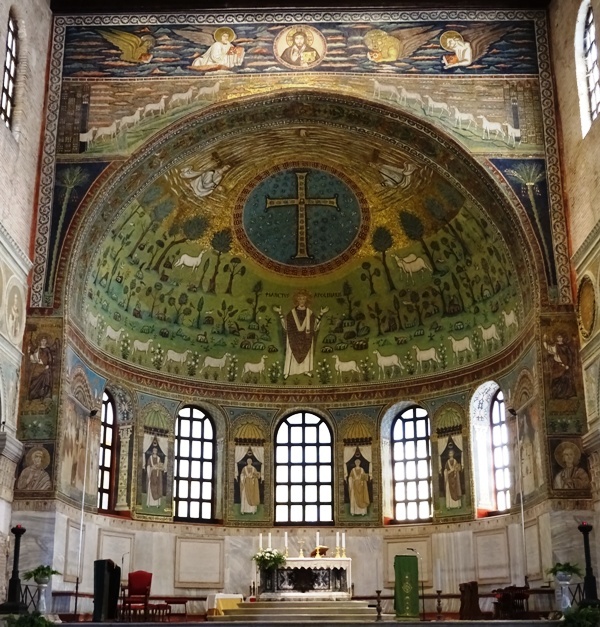 On the left wall of the apse is a panel with a scene that was possibly inspired by the panel featuring the emperor Justinianus in the San Vitale. To be honest, it is of inferior quality compared to the latter. The panel was made in the seventh century and restored multiple times since then. The colours are not nearly as clear and beautiful as those in Justinianus’ panel, and the figures look pale, clumsy and rigid. The two captions make it possible to date the mosaic, although it is possible that parts of the text are not original. 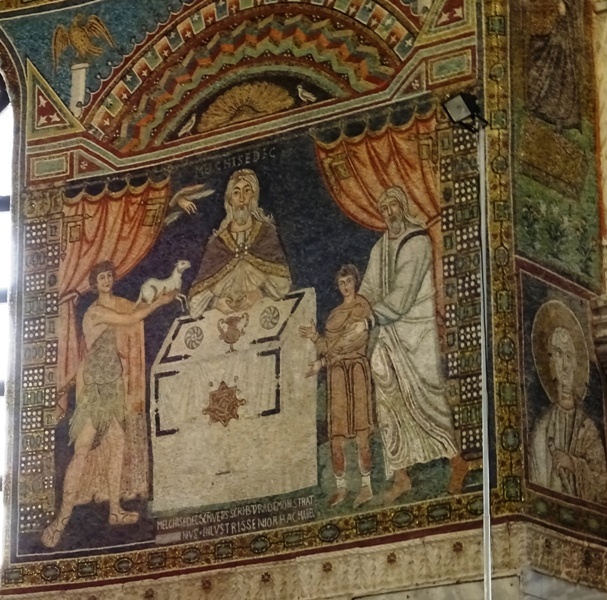 The scene is about the granting of certain privileges – presumably tax concessions – to Ravenna’s archbishops by the Eastern Roman emperor Constantine IV (668-685). Constantine is the haloed figure in the centre, with the imperial red shoes and the ornate tablion on his robes. He is handing a scroll with the word PRIVILEGIA to the archbishop Reparatus (671-677), although it is not clear whether Reparatus is the archbishop with the halo or the archbishop without one. The archbishop with the halo could be Reparatus’ predecessor Maurus (642-671), who in 666 had briefly succeeded in obtaining from Constantine’s father Constans II the privilege of autocephaly or independence from the popes in Rome. On the left, also with a halo, are the emperor’s brothers Heraclius and Tiberius, and a third figure holding a ciborium. On the right are a priest in a golden chasuble and two deacons. Mosaic on the right wall. On the right wall, we see a panel which is basically an amalgamation of the two lunette mosaics with scenes from the Old Testament in the San Vitale. Abel with a lamb, the priest-king Melchizedek and Abraham and Isaac are depicted around an altar with a chalice and two loaves of flatbread. Again, the mosaic in this basilica is inferior in quality compared to the one in the San Vitale. This version of the mosaic may have been made in the 670s, like the mosaic on the opposite wall. However, it is not impossible that it is a seventh century remake of an earlier, original mosaic dating back to the time of the consecration of the Sant’Apollinare in 549. To sum up, a trip to the Sant’Apollinare in Classe is a wonderful experience. It is well worth the detour if you are staying in the centre of Ravenna. The bus service to Classe is quite good and there should be a bus going in that direction every thirty minutes or so. Better still is staying at a hotel in Classe itself, as we did. If you want to be close to history, what more can you do than sleeping just a few yards away from a sixth century basilica?